The oldest hotel still trading in North Sydney, the Rag and Famish Hotel is deeply rooted in the history of the city and of Australia. Originally named the Sailor's Return, the single-story building was erected in 1860. In 1866, a British Navy officer with over 200 convicts under his command sailed into Sydney Harbour. Charles Bullivant bought the hotel and renamed it Rag and Famish, a name that displayed his disdain for the armed services. Now the bar entertains the citizens of North Sydney with weekly events like Tuesday Trivia, Wednesday Band Draw and Saturday Karaoke. You'll be able to catch live music every Thursday and Friday nights. You'll always find an eclectic beer selection that is constantly changed with the beer list instantly updated online. But the bar doesn't stay open long, closing every night of the week at 9:30 p.m. 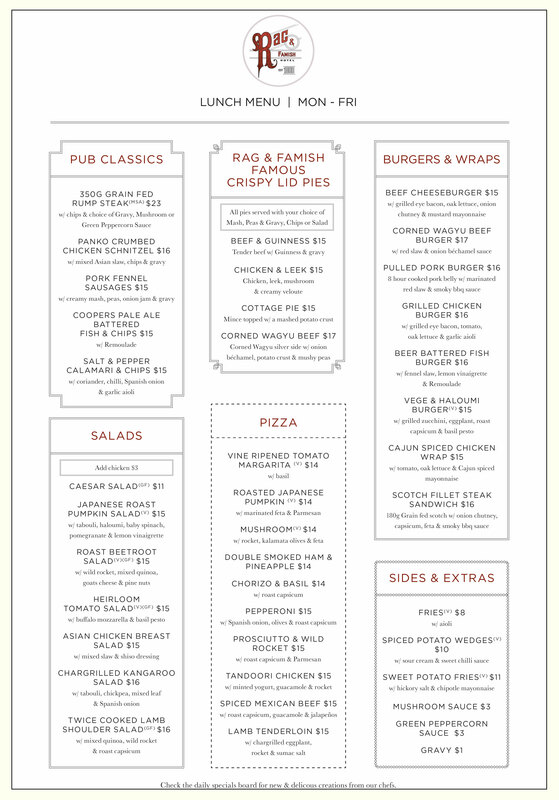 Check out the hotel's bistro for good pub fare and fantastic crispy lid pies. You'll be able to grab a beer at the bar and pair it with burgers, fried chicken and those standout pies. There's a separate sit-down restaurant on Level 1 that serves fancier food like steaks, barramundi and pork. You may need to make a reservation on weekend nights. You can grab a coffee after lunch at Lot 50. The espresso bar, found right next door, is owned by the Rag and open for breakfast and lunch. Lot 50 closes at 4 p.m. every day.